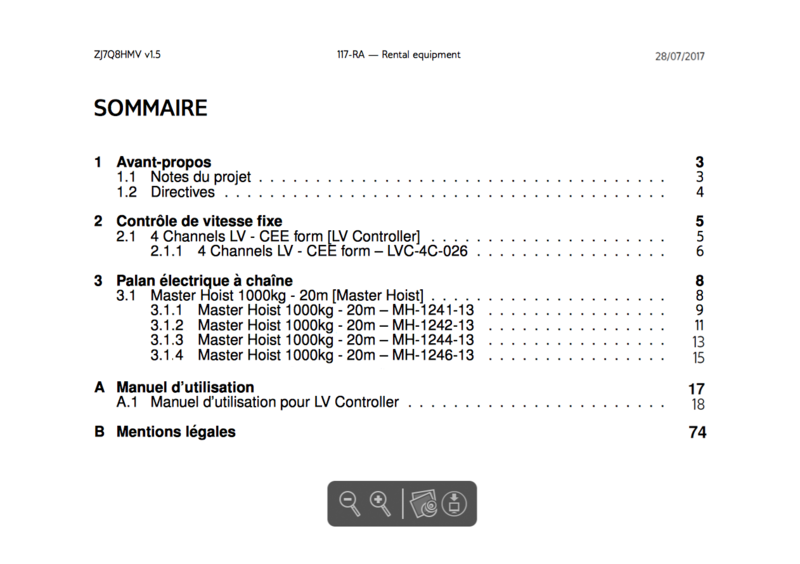 Complete technical files, equipment compliance records, machinery and controls documentation, project planning – all in a single, multi-language, user-friendly application. Access a multi-language stage machinery public documentation library and media. Allow clients to download technical documentation avoiding sending large email attachments. Compile your project documentation’s folder in a simple and user friendly way. 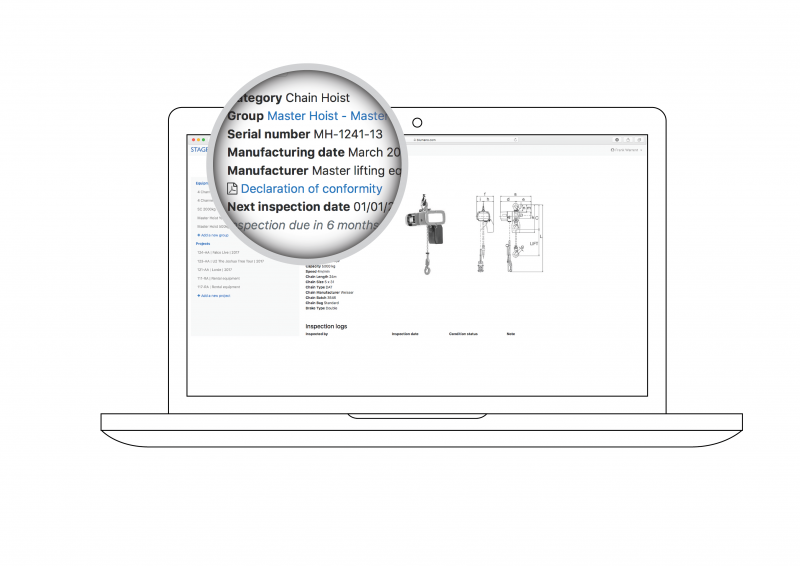 Create groups of items, insert the Serial Numbers and Declarations of Conformity in your inventory: StageDB will organise them for you. 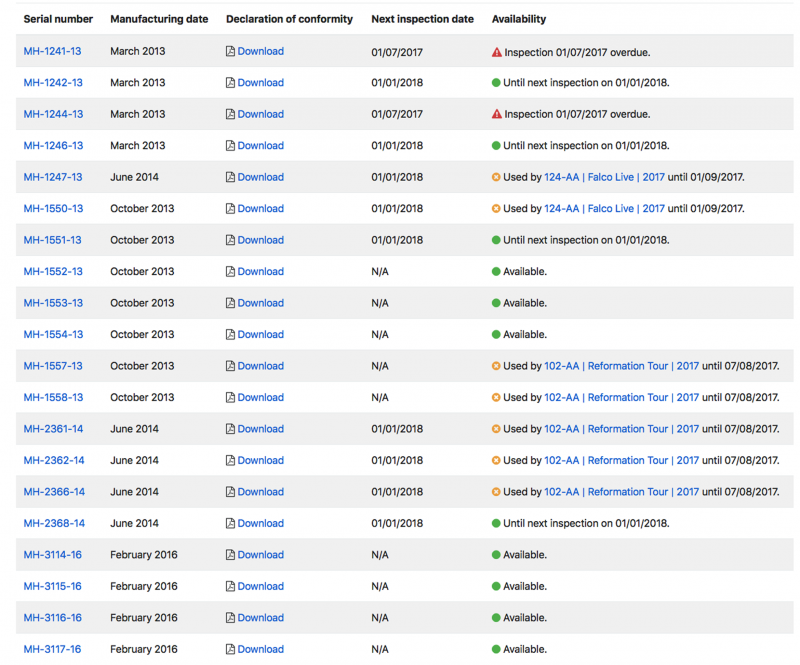 Add last and next examination dates, upload your inspection report or use our built-in templates: StageDB will warn you before the reports expire. Name your project, add start/end date, assign the equipment and attach annexes: StageDB will structure your folder. Choose the output template, select the language and click “compile” to generate a link: StageDB will compile the pdf document. duplications and heavy email attachments. StageDB generates a dynamic pdf file for any technical documentation folder you compile and provides a link that you can copy and send to your clients. If you are compiling project bundles in more than one language, StageDB will issue a link for each file. Send the project bundle in the language you want! Add your Logo, select your brand colour and choose the company font you generally use. 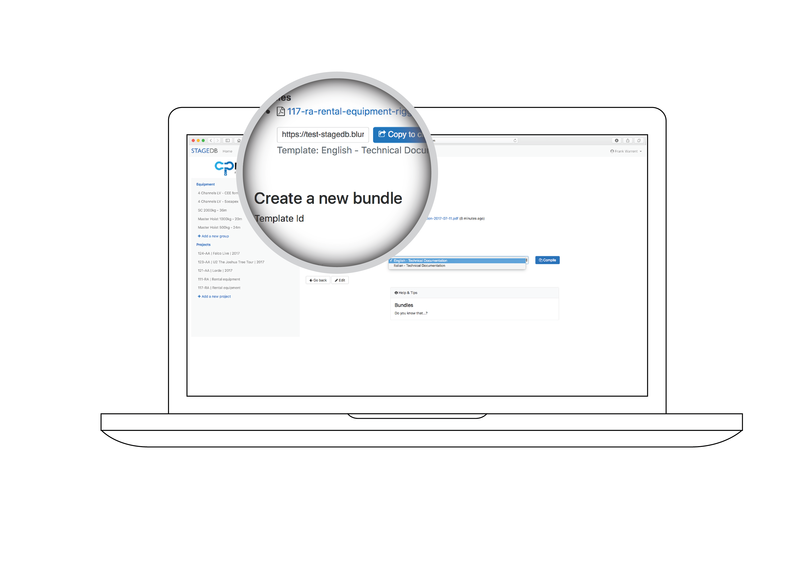 StageDB allows you to create project bundles looking similar to your company templates. Lifting Capacity, Hoist Speed, Control Voltage, HOL, there are so many technical specifications. You can choose the group values and StageDB will assign them to each machinery in the group. Stage Machinery has to be frequently and periodically inspected and sometimes this needs to be done while it is out on tour; StageDB warns you if you are trying to allocate a machinery to a project which will become due for inspection during the tour/before the project ends. 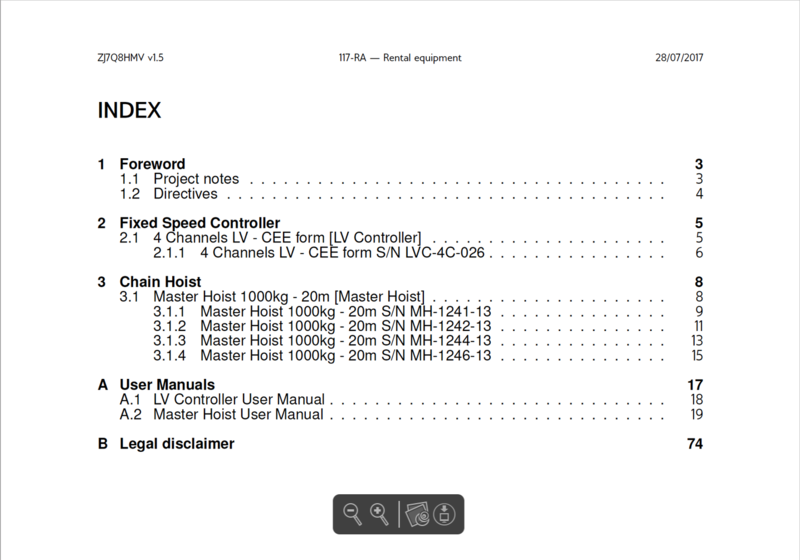 Do you have a machinery or a controller that is not present in StageDB library? 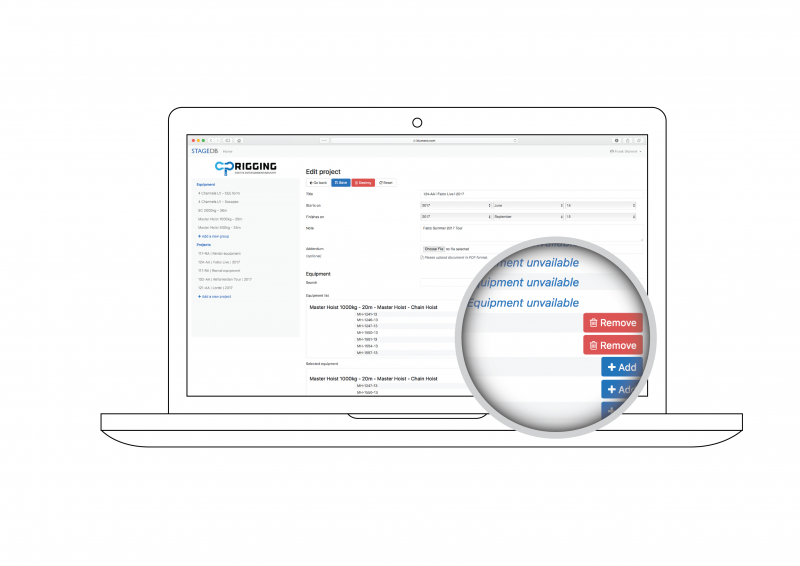 Contact our support team, send us the user manual and a product picture and we’ll add it to the application. If you are the manufacturer you can have it in a private model library. If you have hundreds of machinery and controllers and you don’t want to insert each serial number in StageDB, send us your excel spreadsheet and the StageDB support team will set the groups and import the data. Initial set-up is part of StageDB’s available features. We welcome your suggestions for features to add to our application. Suggestions from clients are considered as part of our regular selection and improvement process. 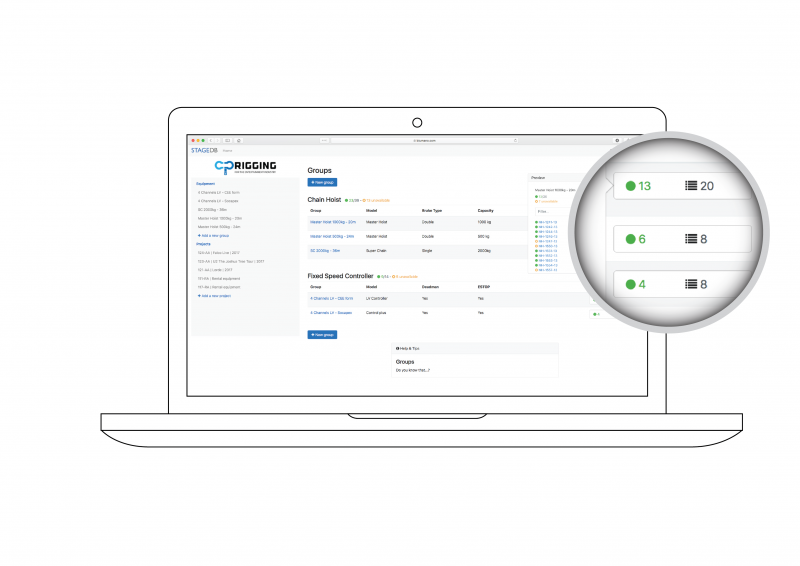 Discuss your request with the StageDB support team and help us to make it even better. Stage machinery compliance fits within the scope of Machinery Directive 2006/42/EC; alongs with good practice and inspections, the Directive requires formal obligations; for example that the equipment is put into service accompanied by a Product User Manual and a Declaration of Conformity. This legal requirement is applicable for Event Industry temporary installations and authorities may require to have access to the public compliance documentation. 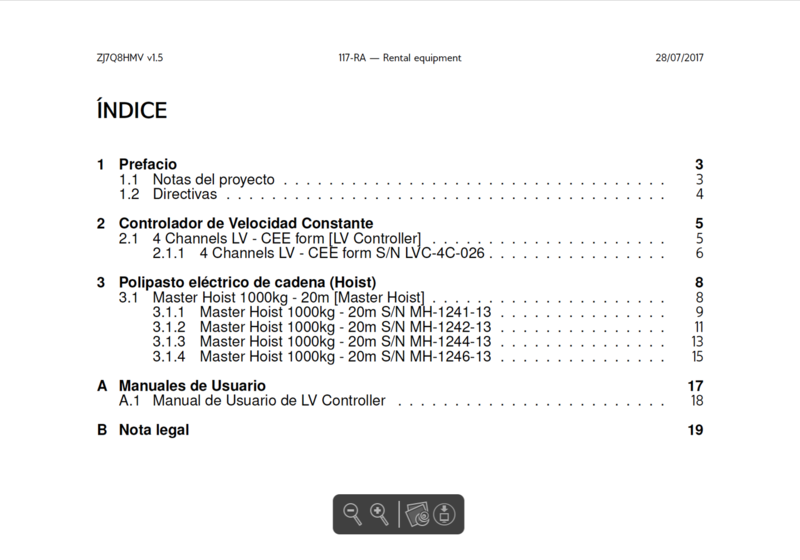 StageDB allows rental companies and system integrators to compile such documentation within the limited timeline of a live event installation. "Creating tricks and special automation effects means it is essential to have all administration related to your automation kit absolutely correct. So … we deliver a full Stage Equipment Technical Documentation (SETD) file for each project or installation which facilitates an easy sign off by the relevant safety authorities, and ensures it’s all compliant within the company’s safety instructions.Safety is Number One on all our projects!! 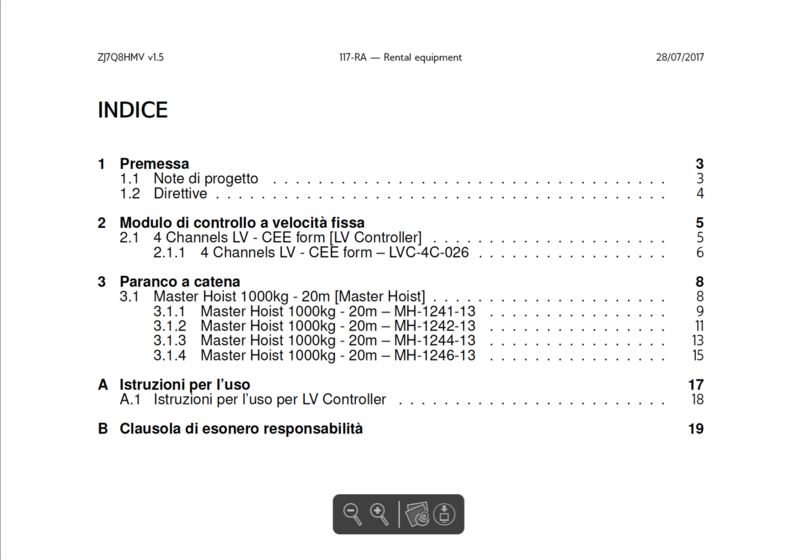 This SETD includes a listing of all lifting machinery elements involved in a full system for the project, complete with their serial numbers. This states and confirms the good condition, maintenance, efficiency and safety of the equipment at the time of the latest inspection. Assembly of machinery User Manuals, Assembly of machinery Declaration of Conformities, User Manuals for all the relevant elements." "To keep this vast body of ‘paperwork’ under control and organised, StageDB is the perfect tool!" "We have already used it on many projects including Take That’s Wonderland tour, Vasco Rossi’s massive concert in Modena, Tiziano Ferro’s summer tour, the Scorpions world tour and on The Rolling Stones ‘No Filter’ European tour.Stage DB makes it very easy if all your documentation is in order." “We have used the services of Blumano on several occasions and in each case they have usilised their extensive knowledge and resources to deliver professional and practical solutions. which enables us to deliver equipment certification in accordance with our statutory obligations throughout Europe and to do so with complete ease and confidence. It’s a winner!”"
Paid users can generate project bundles and send a download link to an unlimited number of free recipients. Free recipients can download project bundle reports, forward the link to other people and provide feedback. However, they cannot create or own a project the way a user can. With StageDB you are never locked into a plan that does not fit. You can add or remove users, change plan, or cancel your subscription at anytime. Try StageDB: there is no risk. After your free trial, if you decide to subscribe for an annual membership you can maintain all your data and settings. We can accept payments in EUR € (Euro) or in GBP £ (British Pound). We can accept various kinds of payments, except for cash. Monthly or annual invoices can be paid by credit card or wire transfer.